It's Monday--Picture Books Past. 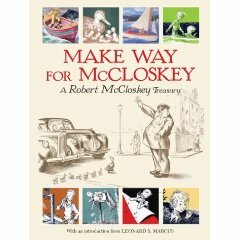 Robert McCloskey is a giant in picture books. His beloved Make Way For Ducklings is a true classic. Below, try a high tech experience of where those famous ducks flew. Below that, a quick look at the sculpture honoring the book in the Boston Public Gardens. Then some real quackers. Read about Robert McCloskey here and here. Listen to him speak about his work as he's interviewed for the Horn Book many years ago here. Check all his books out of the library for a treat and a learning experience. Robert McCloskey was a real hero and favorite in my house growing up. My favorite is Burt Dow, Deep Water Man! I love the fact that he brought ducks to his studio to draw them. I heard Anita Silvey theorize that one of the reasons Make Way For Ducklings was such a hit was that in the story the father leaves - but then the family is reunited later... very poignant for a war time story. That's an interesting point about the father leaving and returning.